Global Chamber® is a thriving and collaborating community of CEOs, executives, and professionals growing in 525 metropolitan areas around the world. We leverage technology and our own business networks to help companies succeed faster and more profitably across borders. 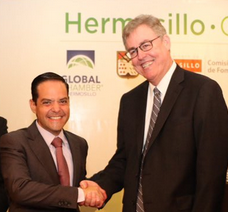 Doug Bruhnke is Executive Director for Global Chamber® San Francisco. He is also CEO/founder of Global Chamber®, helping member and sponsor companies grow globally in and across 525 metro areas around the world... everywhere. Originally from New York, Doug has chosen to live in the Bay Area and he is committed to helping regional companies be more global and successful. He has lived in 7 states and 3 countries (US, Japan and Singapore), and traveled to over 60 countries. Have his daughter and future son-in-law working in Palo Alto adds to his commitment to the region. Personal: Wife of 36 years, daughter who is a remarkable nurse practitioner with Sutter Healthcare in Palo Alto.